An inflatable Lady Bug that has a giant ball pond inside. Loretta the Lady Bug has over 2000 brightly colored balls for the little kids to play in. Loretta is funny to look at on the outside and fun to play with on the inside. Ages 5 and under. Nothing says Southwest like the longhorn and now is your chance to Lasso The Longhorn for a big prize. A must have game for any western theme or large event, Lasso The Longhorn is a toss game for ages 4 years and above. What do you have for the young party guests you ask? That would be the Laugh & Learn Toddler Zone. It is full of fun and specially designed for toddlers. We have created a safe and educational inflatable with our younger guests in mind. Frogs love to leap from lily pad to lily pad and now is your chance to get in on the action. This inflatable toss game involves the ever popular game of tossing frogs and having fun! Ages 3 through adult. Toss the giant 12 sided die and try to land on your lucky number. You have a 1 in 12 chance of having luck on your side! All ages. Get ready for the ride of your life! Eight seconds will seem like an eternity as you try to hang on to Mangus, the roughest, raunchiest, nastiest mechanical bull this side of El Paso. Unlucky guests land on an inflatable mat below, watch out for the cow pies! Mangus is electronically adjustable and can be programmed for all ages and bull riding abilities. sized tokens are tossed to dot the spot. The token must completely cover the spot to be a winner. Dot The Spot is one of the toughest games on the Mid-Way. Available as a mega game. All ages. Eight guests at a time try to stay perched atop their foam pedestal as the Meltdown does its best to eliminate them. Duck under and jump over the spinning barricade, if you don’t make it you land safely on the inflatable below. A high participation game that is crazy fun to play, but just as fun to watch… It’s time for a wipe out! For guests 48” and taller. The licensed Mickey Park Learning Club is the perfect way to combine active fun with a stimulating learning environment. Youngsters will engage in a trio of educational games including a shape activity with Mickey Mouse, matching colors in the large ball pond and counting shapes with Goofy. Colorful pop ups and 3D characters abound in this bounce house, and an exciting climb and slide will have them laughing all day. Toss the softball into the milk can to win the big prize. Unfortunately it's just not as easy as it looks. Another classic when you want an authentic midway carnival game. Ages 5 and above. The smaller cousin of our Big Shoe Basketball is perfect for smaller venues and tight spots. Put the Mini All Star up and watch your guests run to shoot baskets and enjoy our new and unique inflatable. Two players at a time use mini basketballs to shoot and score. Quarter sized tokens are tossed to dot the spot. The token must completely cover the spot to be a winner. Mini Dot The Spot is a table game for all ages. 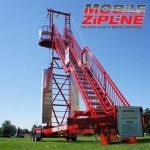 After years of product development and testing, we are ready to release our highly anticipated mobile zip line. Two participants at a time climb the 35' tower and are secured to a zip line cable. Riders then jump off the tower for a free fall experience before zipping 100' feet to the end of the ride. This is one ride that will be talked about for months after your event! The \Cash Cube\ is shaped like a gigantic slot machine and features many extras. The fully adjustable timer and custom \stuff-it\ pouch keep the winnings controlled. Unfortunately money is not included! This NASCAR style obstacle course is fast and exciting for both kids and adults! Two opponents race in opposite directions through a figure eight race track where a series of obstacles awaits you around every corner. The crash course is sure to be a winner at your next event.